I’ve been both excited and nervous about my trip to Kitt Peak. I’m excited because observing is fun and the science is cool, but the program I have planned is also technically challenging and uses a brand new instrument, which is a little scary. In addition, although I’m plenty experienced with data, I haven’t done a lot of hands-on observing. My PhD thesis used Hubble data, and Galaxy Zoo uses both Hubble and SDSS data — neither of which you take yourself. Because observing is a useful skill for my profession, I made sure to get some experience while I was in grad school, but this is my first solo run to collect data for my own project. I’m here to get very deep images of some of our bulgeless AGN host galaxies, so if it doesn’t work out I’m probably going to be heartbroken. And clouds or technical issues are one thing, but I’ll be even more upset if I fail because I make a mistake that a seasoned observer wouldn’t have. I don’t want to let the Galaxy Zoo participants down! So I’ve been reading the instrument manuals and scouring papers that have done similar work in the past. The pressure is on. This is just one of many images Kathy took, all of which will eventually be combined to fill in the chip gaps and get rid of the usual artifacts. The instrument is working very well — it’s a good thing instruments don’t get as tired as their observers! Another good reason to arrive a night early is to give yourself time to get adjusted to the observing schedule. So. Why am I observing these objects? What am I hoping to learn? More soon… for now it’s the start of my second night, and I have to get started on calibrations! I swear we are consistently trying to keep our live hangouts to about 15 minutes. We have so far failed at keeping to time, but hopefully also succeeded in the sense that we only run over because there’s so much to discuss. We had a number of good questions from Twitter, Facebook and the blog about various types of galaxies — from red spirals to green peas and blue ellipticals — and I rather arbitrarily decided this was an indication that our hangout should have a color theme. That is, what exactly does “color” mean in the context of astronomy? 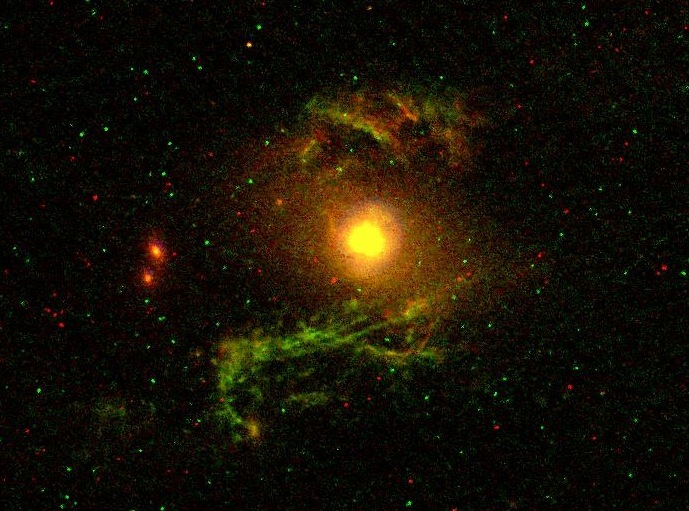 What is going on physically when a galaxy is one color versus another, or has multiple colors? Is color information always telling us the same thing? We tried to address all those questions, as well as show some examples of different galaxies in the above queried categories. As a bonus, we learned how galaxy colors are related to the town my grandparents retired to. (This post’s title is a quote from the Green Valley Chamber of Commerce’s official website.) That was as much a surprise to me as it was to the viewers! We also talked about what’s currently going on in Galaxy Zoo behind the scenes. 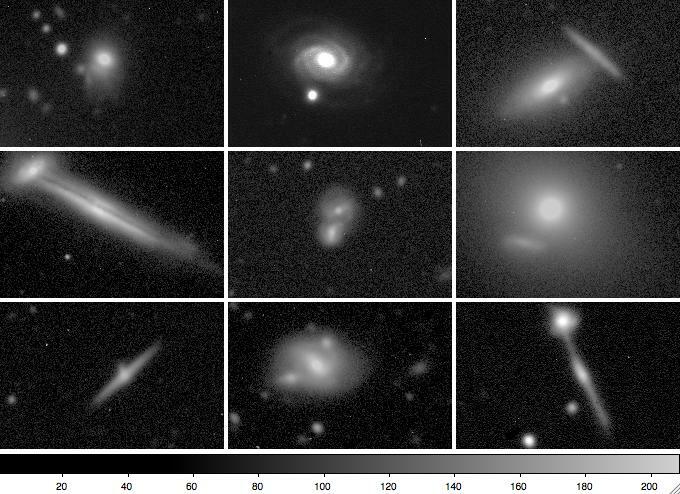 Earlier today, Kyle sent around a really nice draft of the Galaxy Zoo 2 data paper for the team to read and comment on (you’ll have to watch the video to get a sneak peek at some of the figures). And it’s that time again: Hubble Space Telescope proposals are due in about a week. We talked about the proposal process from concept to submission to review, discussing both specifics of certain telescopes and the general practices that (we hope) help lead to a successful proposal. Here’s a hint: it may not be what you think! Is it a triple merger? A double overlap? A hybrid? A blue(ish) and red spiral. A red and blue elliptical. A tiny green pea galaxy, and zoomed-in at right. 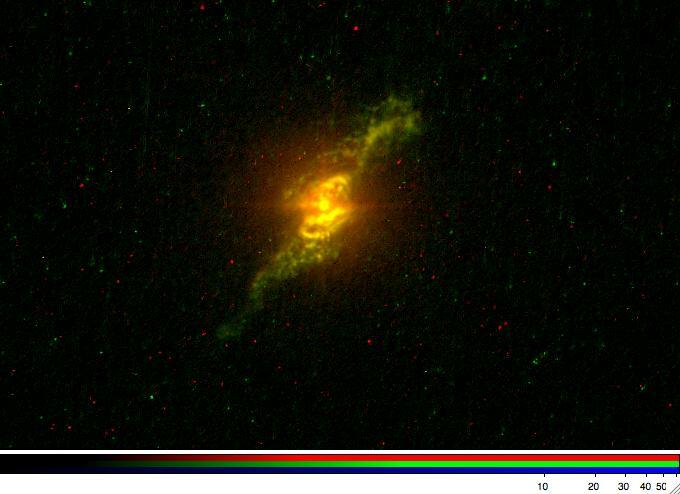 Following on the heels of the 5th anniversary of Galaxy Zoo itself, this week marks five years since Hanny pointed out the Voorwerp. Looking slightly ahead, next week, Alexei Moiseev, known on the Zoo forum from his wrk on a catalog of polar-ring galaxies based on a clever use of Zoo-1 click data, will be working with us next week, obtaining radial-velocity maps of three of these galaxies using the 6-meter Russian telescope in the Caucasus (the BTA, Bolshoi Teleskop Azimutalnyi or Large Altazimuth Telescope). accretion phenomena. That, and wish everyone a happy, highly-ionized and just slightly late 5th Voorwerpendag! 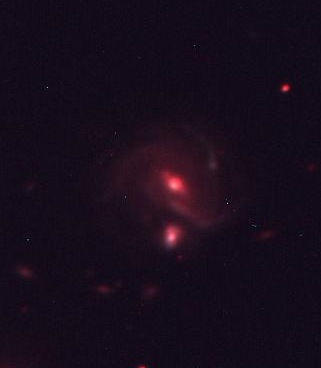 Our Hubble image of Voorwerpje galaxies continue to come in, and it seems each one is stranger than the last. 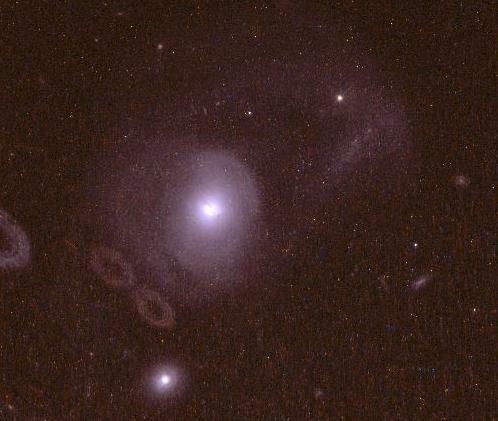 Overnight we got our data on the Teacup system (SDSS J143029.88+133912.0). This one attracted attention through a giant emission-line loop over 16,000 light-years in diameter to one side of the nucleus. Another giant hole whose origin is obscure. The loop doesn’t even show much sign of being connected to the galaxy. The strongest [O III] does seem to trace out ionization cones, as in showing from structures near the nucleus, but that seems independent of the distribution of the gas. There are filaments in the gas that are nearly parallel, sort of like waves. Well have our work cut out for us to understand more of what’s going on here. 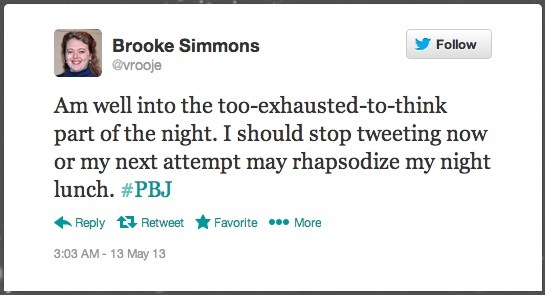 I can hardly wait for the next one! There was an extra treat for me with these observations. Last night, I interrupted a session with my summer class at the campus observatory to look south with binoculars and catch Hubble passing far to the southeast, no more than 13 degrees from our horizon. This was during the Hα exposure, so I saw it while it was doing these observations (it was pointed just about up in my frame of reference, as it happens). 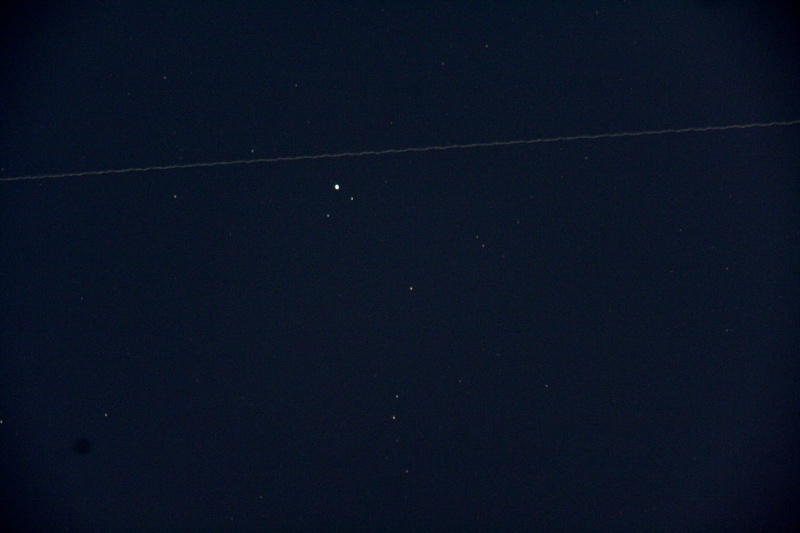 I got a picture through a 125mm telescope, showing the telescope streaking by just north of the star k Lupi. At the time, Hubble was 1600 km away over Cuba. Hubble was watching the Teacup, I was watching Hubble, and a couple of slightly puzzled students were watching me. Hubble trails across the sky north of the star k Lupi in this telescopic view. This is… interesting. From the few of these galaxies where we have data so far, loops of ionized gas near the nucleus may be a recurring theme. I could add speculations on what we’re seeing in Mkn 1498 – but for now, I’ll just let everyone enjoy the spectacle. 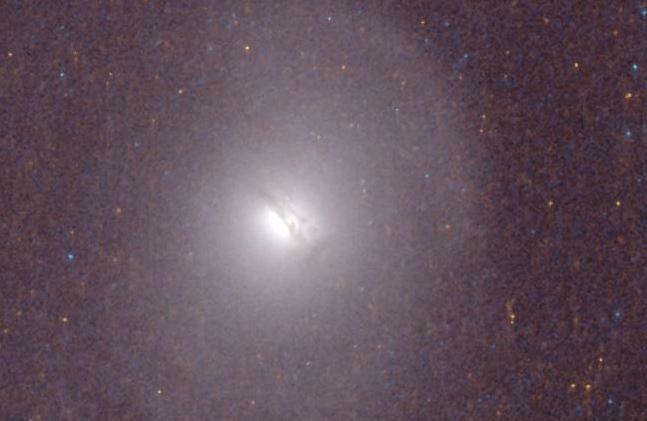 Overnight, Hubble got our first data on perhaps the most spectacular Voorwerpje host galaxy, the merging system UGC 7342. We have to wait until almost the end of the year for what we really wanted to see, the ionized gas. The telescope has particular time pressure in some parts of the sky (as if it doesn’t have extreme time pressure on everything people want to do with it), so we split the two sets of images to fit the schedule better. 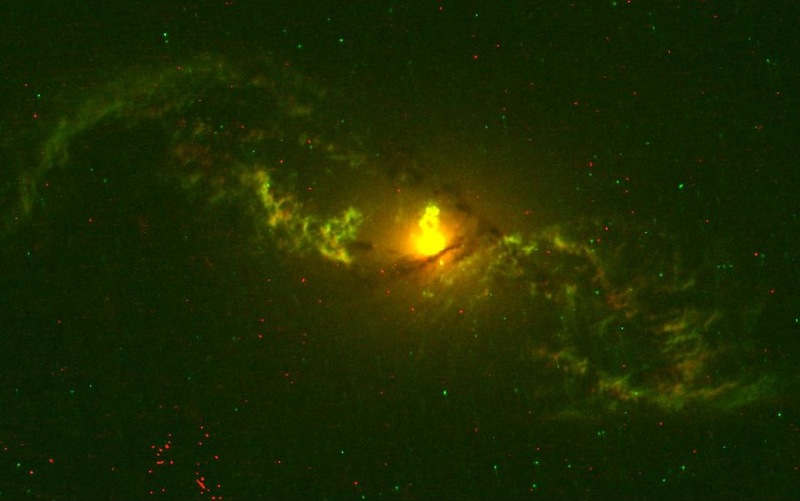 This time, we got data in WFC3 for two medium-width filters in the orange and deep red, selected to be essentially blind to emission from the gas. These will be used to subtract the contribution of starlight from the gas images, so we can analyze the gas properties cleanly. 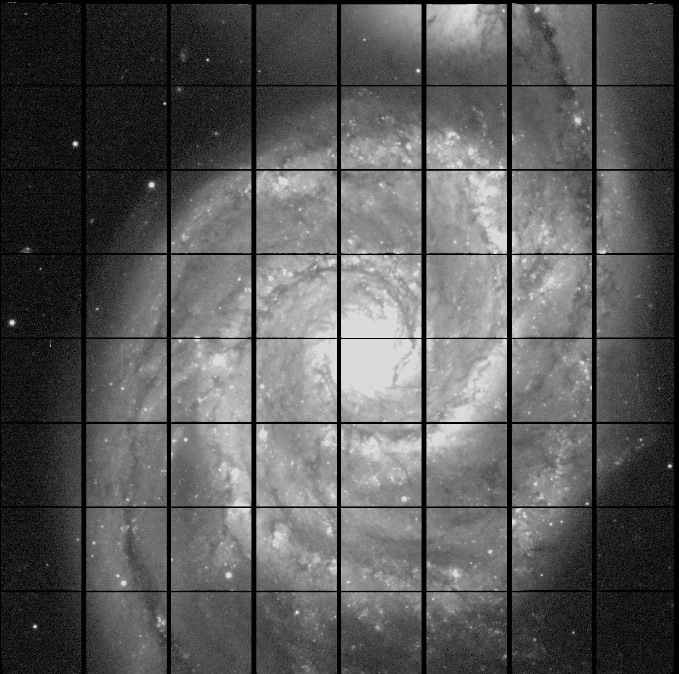 The emission-line images use the older ACS camera, which has a set of tunable filters which can isolate any optical wavelength we need. They come at year’s end, because we have to specify a particular range of orientation angle of the telescope to fit all the gas in their 40×80-arcsecond filter field. That, plus the requirement that the solar arrays can face the Sun directly, gives us a restricted time window. 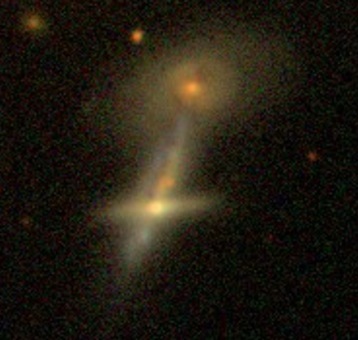 As a reminder, here’s UGC 7342 from the SDSS data. This show the companion and tidal streamers of stars. UGC 7342 itself shows shells of stars, which can be formed when a lower-mass disk galaxies merges with a more massive elliptical. With some additional velocity information, those might be able to give a time since the merger (with some tailored simulations). 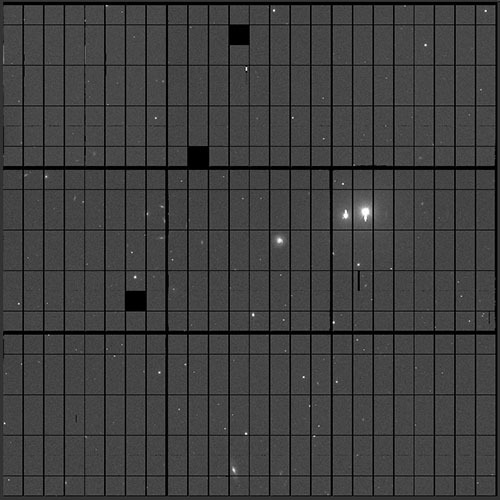 The elliptical reflections are from bright foreground stars outside this trimmed view; the emission-line images will at least have these in different places, using a different camera and different telescope orientation. Zooming in 4 times to the nucleus shows that UGC 7342 has complex dust lanes crossing in front of the core. These are perpendicular to the directions where we see that distant gas is ionized by radiation from the nucleus, which is pretty common. 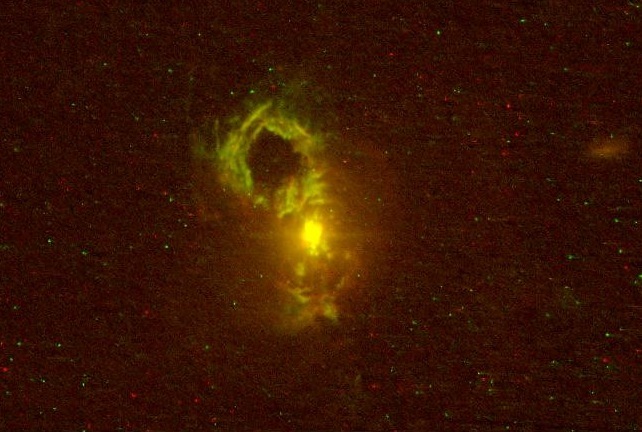 The fact that the dust (and almost certainly associated gas) wraps at right angles to most of the structure in the galaxy is another indication that a merger took place recently enough that the situation hasn’t settled down into a long-lasting remnant. Next up? The scheduling windows for SDSS 1510+07, NGC 5972, and the Teacup AGN all happen in overlapping spans from June to August. Bring on the bits! The end of this observing run made up for the unnecessarily interesting variety of weather early on. Calm, clear skies, ran through an object list just as fast as we said in the proposal. Here’s a montage of the red-light images from 9 of the target galaxy pairs done on night 4. That’s it for this run. But we’ll be back there late next month to really clean up the target list. Night 2 at Kitt Peak – watching out or blown away? 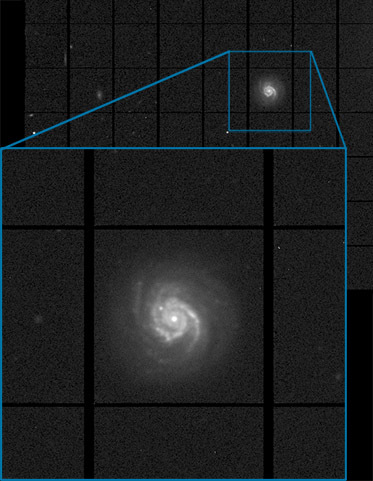 The forecast for tonight’s continued imaging of Galaxy Zoo overlapping galaxies was marginal, with a storm expected. That has not yet materalizd, ut the wind have been so high that, after the anemometer flirted with the 72-km/hour safety limit for two hours after sunset, I finally had to shut down a little whole ago. There are data on two pairs so far tonight, and I’ll naturally keep one eye on the wind speed. If it drops back, I’ll open again. Meanwhile, there has been time to look over last night’s data and do some basic processing. Here, for example, is a quick and dirty composite image of Markarian 238 and its larger spiral companion from B and R images. The display is set to show the inner structures most clearly. Some random thoughts while observing: Cherry Pepsi cans look really weird under a red flashlight. And email today brought some encouraging news on another Galaxy Zoo science front. (0710 UT, three hours later) The wind continues to howl under a frustratingly clear sky; some clouds are just appearing which may be parts of the predicted storm system. Gusts up to 83 mph (133 km/hour) have been recorded in the last hour. With the outside temperature less than 2 C, I try not to think of the wind chill.